Very Very Vicky: Talking Turkey About Thanksgiving Table Setting! Talking Turkey About Thanksgiving Table Setting! Getting ready to set your Thanksgiving table? I'll bet you already own most or all of what you need to set a beautiful table without spending a fortune. Let's talk turkey about how to pull this off! This is what my daughter Meghan and I did last year using what was out in the yard and combining it with what I already had. It's easy to do--I'll show you how! First we put a tablecloth on the table. I have a golden yellow one that I picked up years ago from Linens n Things or Bed, Bath and Beyond. This is a good time of year to get tablecloths if you need one--all the stores have a good supply and they are very inexpensive right now especially with coupons (Bed, Bath and Beyond will usually honor even expired coupons). Or you could use a runner instead--I love the burlap ones I've seen and I think even brown kraft paper would look kinda cool. Next we added plates...these are my "everyday" plates chosen because they are dishwasher-safe and my fine china is not. I was trying to keep clean up easy. Napkins. I found these easy-care napkins on clearance a few years ago and liked the brown for their autumn feeling as well as their stain-hiding attributes. Paper napkins can work too. I put them on the plates to save space because I needed to squeeze lots of people around the table but you can also place them on the left to the outside of the fork. on each side of the table. Still looked a little bare-bones so we picked some leaves from the yard. Most of the prettiest colored ones had fallen already but there were a few left and they filled in beautifully. They were just placed under the pumpkins and tucked in here and there. And candles were added. "The Rules" say candles should only be lit in the evening but I say "throw caution to the wind" and light them if you want to for a festive feeling! Finally Meghan added glasses and silverware. Remember the fork goes to the left of the plate. The knife goes to the right--next to the plate with the blade facing the plate. The spoon goes to the right of the knife. 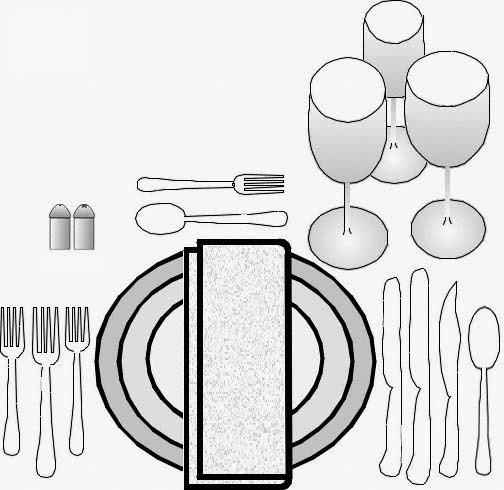 I usually place the bottoms of the plate and silverware about an inch from the edge of the table. I put the glass at the top right of the setting right above the knife. It doesn't matter whether you are seated at a formal or a casual table setting. It doesn't matter whether or not you eat off of fine china, everyday china or paper plates. Ultimately, what is important is that you gather together with those you love and those that need to be loved to consider and celebrate the blessings in your life...and to cultivate an attitude of gratitude. How do you "do" Thanksgiving? What are some of your cherished traditions? What are you thankful for this year? Please take a moment to share. And have fun getting ready! We used my "everyday" dishes and glasses because we wanted to make clean-up easy on ourselves and they could go into the dishwasher. Looks lovely. For the first time in thirty years, I did not host Thanksgiving. Where did you go? Hope it was a happy day! "Sign" Me Up For Some Beach Therapy! Lovin' Me Some Bloglovin' ! !